I love quirky fabric and morning walks. Follow me on Instagram @cerigwen. 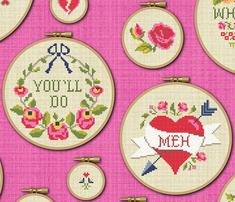 A collection of pretty cross-stitched embroidery hoops for Valentine's Day - but with some rather surprisingly cynical sentiments. 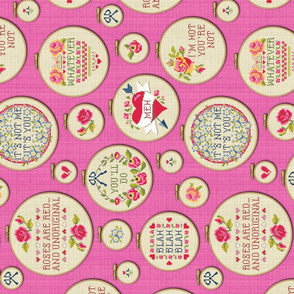 clothcraft says: I LOVE this. 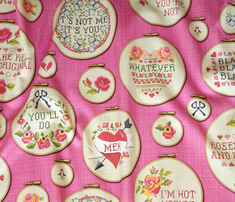 Please, please rotate it to so I can print some fat quarter tea towels! cerigwen says: Ha ha thank you Su! It was a thrill to see it on the blog. I did have to bribe my model though. su_g says: Ceri your apron looks terrific - and I saw it featured in the Spoonflower blog too which was great to see... Love the apron-wearing pose too - really shows that deep pocket off (such a great idea)... but where are the love spoons??? 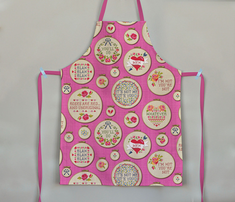 vannina says: Fabulous apron, Ceri! 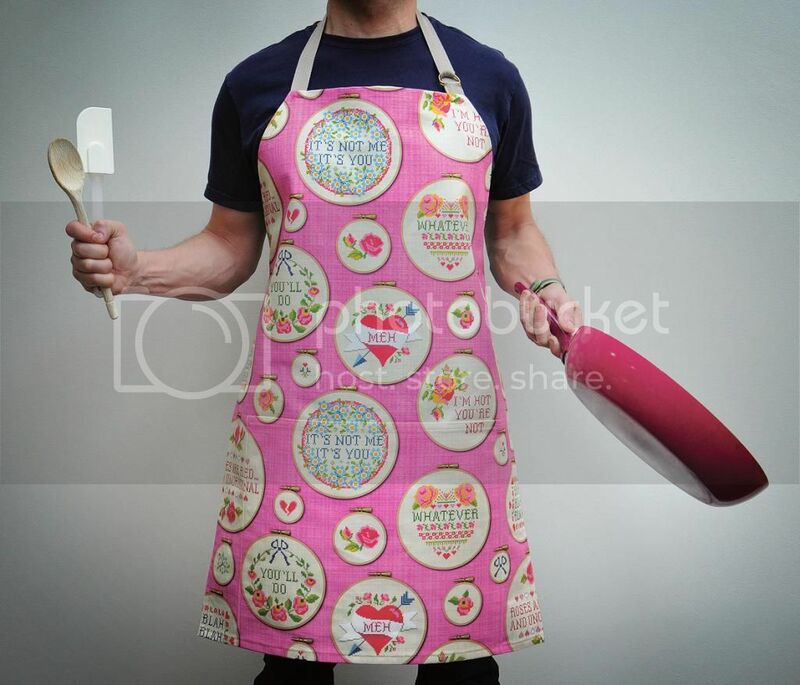 ottomanbrim says: Love that apron!! cerigwen says: Apron I made from a yard of linen cotton canvas. It has a deep pocket running along the bottom. cerigwen says: Thank you Boo! I'm sorry, I seem to have missed lots of comments lately! bippidiiboppidii says: Hilarious Ceri - your design is a hoot. Having your birthday on Valentines Day... not so much. Sounds almost as bad as having it on Christmas day... But the design is great in every way! magentarosedesigns says: This is really gorgeous and so clever Ceri! Im sorry that your birthday falls on Valentine's Day and I think maybe you should have a second birthday (like the Queen!) so you dont have to share with St Valentine! Such an amazingly beautiful design and in such pretty colours! cerigwen says: Thank you so much for your wonderful comment Sheri, I really appreciate the time you took to look at my work. 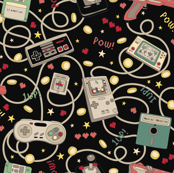 I'm quite new to Spoonflower too - started making patterns less than a year ago. So welcome, and I hope you have a lot of fun here (and I'm sure success too, judging by your lovely designs). robinpickens says: I'm waaaaay behind on catching up on spoonflower...but I still had to congratulate you on your funny and wonderful design for this competition! love it! susan_polston says: Happy belated birthday! You are worth celebrating! chicca_besso says: Congratulations! Beautiful design and composition and the colors are perfect! What a beautiful irony! pennycandy says: Congrats on such a super-awesome 2nd Place finish, Ceri! 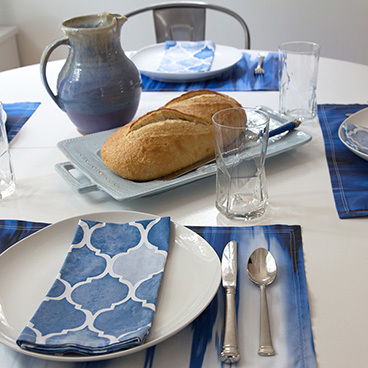 The fabric prints just beautifully! kimruss@thatcatart says: Many, many congrats, Ceri ! This is beautiful and funny. 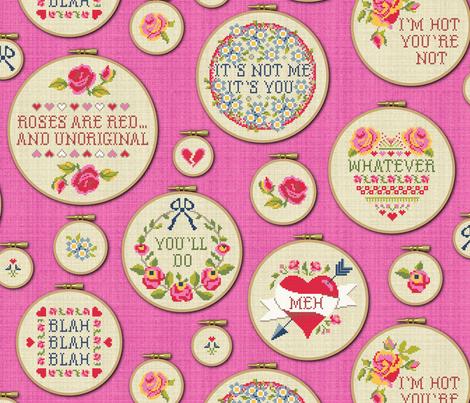 atate says: Anti-Valentine's Day Cross Stitch Design Challenge Top Ten! cerigwen says: Thanks Jill, Su, Mira and Pat! :) x Yes Su, people are wonderful. chickoteria says: Hey Ceri....coming in late with congratulations :) ! And HAPPY BIRTHDAY! 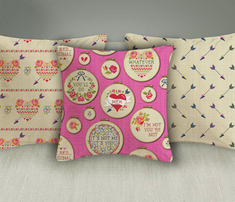 su_g says: So pleased to see your charming design in the winning circle - and on your birthday too! Happy birthday and congratulations! And what an excellent idea by yduj too - aren't people wonderful? jill_o_connor says: ps we're in the same country so nearly does count!!! jill_o_connor says: Congratulations Ceri. Happy Birthday for tomorrow or is it now, nearly!! Brilliant work! cerigwen says: I've had a celebratory beer and am admiring the bunch of supermarket flowers my husband brought home tonight. Lol! radianthomestudio says: Congrats! Nice job! vannina says: Congrats, Ceri! This design is really fabulous! 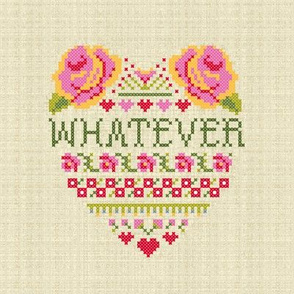 yduj says: Sorry if this has been covered, but do you have fabric with the actual cross stitch designs on it so that you could really cross stitch one of these pieces? If not, you should. I love these along with everyone else! Congratulations! nellig says: Congratulations on your triumph, Ceri! cerigwen says: Thank you so much everyone for the favourites and votes! Best birthday/valentine present EVER!! Grinning from ear to ear! liluna says: Congratulations Ceri ! fabulous! paula's_designs says: Well done Ceri on your awesome design! 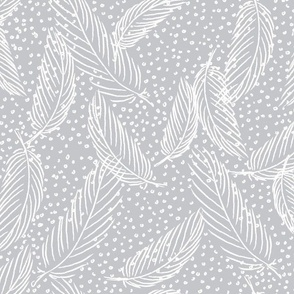 juliesfabrics says: Congratulations for being in the top ten with this grandmotherly beautiful design! keweenawchris says: Congratulations Cheri! Well done. ottomanbrim says: Congratulations!!!! Such a wonderful design! cerigwen says: Thank you so much Ana! cerigwen says: Thank you so much Lucie! All the best to you too Paula with your amazing design! Diane - congratulations on the baby's arrival!! I'm tickled that you find this funny and happy birthday for the 16th! paula's_designs says: Awesome design Ceri, it's so good, best of luck with it! cerigwen says: Susan, Mary, Kim, Amy, Jill and Amy g! Thank you so much for your lovely lovely comments. I'm grinning from ear to ear (inbetween cursing my Internet provider)! pennycandy says: Magnificent, Ceri! 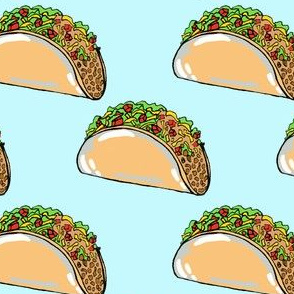 Unique, fabulously illustrated and detailed, versatile, and the mockups are amazing. Got one of my two votes! kimruss@thatcatart says: I'm still smiling after reading your cross stitch, Ceri. I hope you get a top 10 win as a birthday present this year. Next year, I suggest you make birthday dinner reservations at a lovely restaurant far in advance. Buy a new outfit. Remind your husband to bring his credit card or plenty of cash. After all, you intend to have dessert. Probably cake..
mezzones says: So clever! Good luck in the contest! susan_polston says: This is absolutely wonderful. I love it! cerigwen says: Wow thanks for all the favourites and comments, I'm really touched. So frustrating not to be able to comment easily on all the great designs - internet still down here! For those who have enquired, this design is now in my shop. Thanks so much! 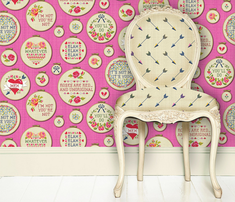 radianthomestudio says: The pink background really makes this design stand out. Great contrast. And Happy Birthday! cooper+craft says: I . LOVE . THIS . PRINT!!! cerigwen says: Thank you so much Shelly! I am still without a phone line or internet. Just slow internet on my mobile (cell) phone. 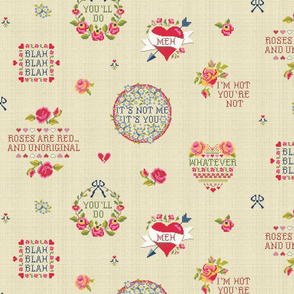 I am suffering Spoonflower withdrawal! shellypenko says: Super cute! I love it and I love your clever mock ups too! cerigwen says: Thank you so much Christine and Vannina! My Internet at home is down and it's really difficult to navigate this site with the slow connection on my mobile phone! Hopefully I'll be back up and running in a few days. vannina says: What a fabulous design!!! Very funny and clever :D. Good luck Ceri and happy birthday! 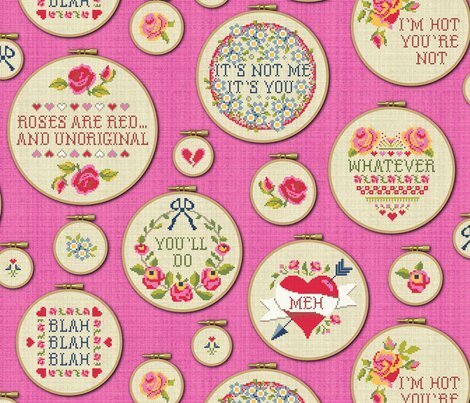 rhondadesigns says: Your heartfelt cross words of anti-Valentine Day sentiments are displayed in some exquisite samples of cross-stitched embroideries! 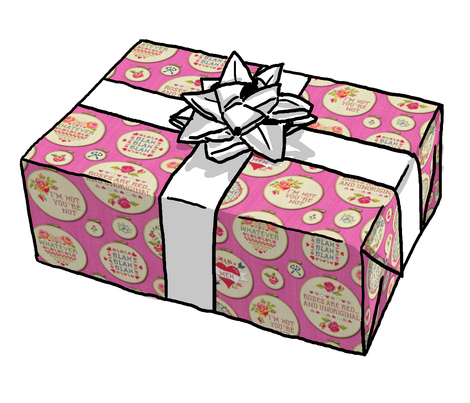 Happy birthday for the 14th, Ceri! Lol, If you look at life from the bright side, you can embrace the day and enjoy the fact that all those starry-eyed folk are spreading warm and fuzzy vibes around as they celebrate YOUR special day! spellstone says: :o) very good! 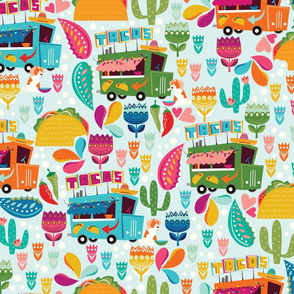 whimzwhirled says: This design is so fun. I have always felt bad for those whose birthdays fall on major holidays. Most men are like lumps of coal when it comes to romance. Since you know he does this you should just go ahead and make the reservations and tell him what he is doing that night. They have to be trained dear. If you're waiting for the magic genie to show up you will never get a good meal. I believe he will appreciate you for helping him out. You will at least get to go out and splurge on yourself instead of staying home bumming out. A win win. su_g says: As Scrummy says: cool, funny and brilliant: you nailed it! And I nearly cried myself reading your long description! Life is so unfair! Still I think you've got some of your own back with this terrific design! karinka says: oh I love it! scrummy says: WOW so cool and funny and brilliant!!!!! ottomanbrim says: So soso funny and such a great design! I can't stop laughing! Happy birthday too! cerigwen says: Detail to show cross stitches.